Copyright 2014 Jelinek et al. ; This is an Open Access article distributed under the terms of the Creative Commons Attribution License (http://creativecommons.org/licenses/by/3.0), which permits unrestricted use, distribution, and reproduction in any medium, provided the original work is properly cited. 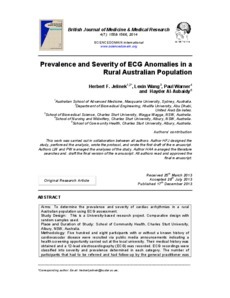 Aims: To determine the prevalence and severity of cardiac arrhythmias in a rural Australian population using ECG assessment. Study Design: This is a University-based research project. Comparative design with random samples used. Place and Duration of Study: School of Community Health, Charles Sturt University, Albury, NSW, Australia. Methodology: Five hundred and eight participants with or without a known history of cardiovascular disease were recruited via public media announcements indicating a health screening opportunity carried out at the local university. Their medical history was obtained and a 12-lead electrocardiography (ECG) was recorded. ECG recordings were classified into severity and prevalence determined in each category. The number of participants that had to be referred and had follow-up by the general practitioner was determined. Results: Moderate to severe ECG anomalies, which included atrial fibrillation or left bundle branch block were identified in 58 (11.4%) of the participants. Forty (7.9%) individuals with ECG anomalies were referred to the general practitioner for further evaluation. Eight participants did not seek further advice. Twenty-two (68.8%) participants that made an appointment to see their general practitioner were either commenced on treatment, had their treatment changed or received surgery. A further 85 (16.7%) of individuals required regular follow-up in line with their ECG characteristics and other health information, presenting with non-clinical ECG changes that had the potential for adverse health outcomes in the future including long QT interval, right bundle branch block or left ventricular hypertrophy for instance. Conclusion: Our study has demonstrated that a substantial number of patients in this rural community have both ECG abnormalities and or cardiac arrhythmias that required regular review or commencement of treatment by their doctor.